These six preludes for solo piano were completed in 1965 and are some of Burgess’s earliest surviving solo piano compositions. They are characteristic of Burgess’s musical style in a number of ways, including the use of fourths and metrical ambiguity, and also showing the influence of Debussy’s pieces for the instrument. These Preludes were later to provide much of the main material for Burgess’s Concerto for Pianoforte and Orchestra in Eb (1976). 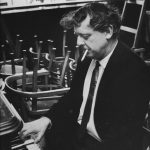 These pieces are included on the recording The Piano Music of Anthony Burgess, performed by Richard Casey and available on the Prima Facie label.